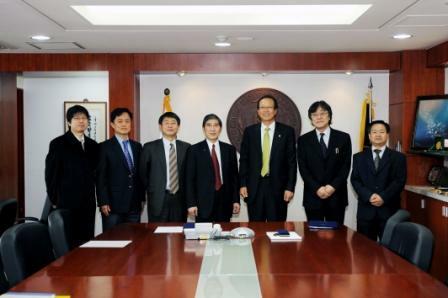 Pictured from left to right: Dr. Junho Kim, Dr. Suntae Hwang, Dean Duckjoon Chang, ISU CS Department Chair Carl Chang, KMU President Sung Woo Lee, Dean Chong-Woo Woo, Chairman Jae-il Han. Department Chair Carl Chang recently visited Korea to finalize a partnership with Kookmin University (KMU), located in Seoul, Korea. KMU is the first established private university after Korea's liberation in 1945. KMU has 23,000 students, and offers both undergraduate and graduate degrees. ISU and KMU have entered into an agreement for a new dual undergraduate "2+2" degree program in computer science, and a dual "4+2" graduate degree program in computer science. Under this agreement, qualified undergraduate or graduate students from KMU who have completed part of their studies at KMU, and meet the admission requirements at ISU are eligible for dual computer science degrees through both universities. In addition to the degree programs, the department and KMU will also participate in faculty exchanges, joint research programs, and joint outreach programs. "These kinds of arrangements will increase the diversity of our undergraduate student population and improve educational experiences for undergraduates from all over the world in working with students who come from a different cultural background. The ability to work in a multi-cultural environment has become essential to our future graduates as the computer and information industries are increasingly becoming global enterprises," said Chang, who encouraged the agreement with KMU. This belief is shared by Sung Woo Lee, President of KMU, who seeks to foster internationalism and a respect for multiculturalism at his institution. The next steps for the joint programs and outreach efforts will include discussions on faculty and staff exchange and course mapping to match curricula requirements for each side. "Internationalizing educational opportunities has been emerging as a global trend," Chang states. The department hopes to continue making international connections with other universities to make graduates in Computer Science at ISU competitive in the global job market.